The International Space Station is a spectacular facility for conducting scientific research in many fields, but occasionally work must be performed outside the structure. 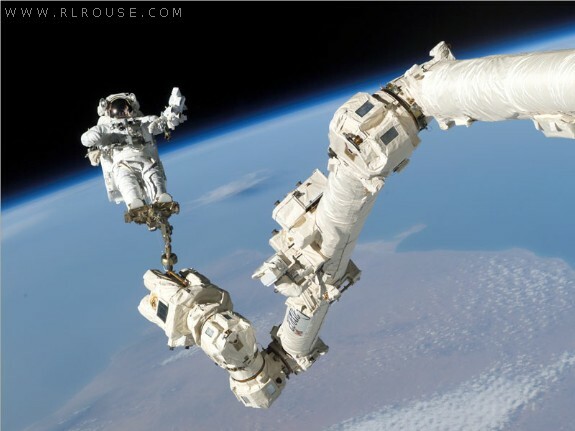 The space station's robotic arm Canadarm2 is perfect for these "outdoor" tasks. Canadarm2 is over 57 feet long and fitted with multiple joints making it extremely maneuverable for performing all kinds of maintenance and research procedures. When high levels of precision and detail are required, a human astronaut can be anchored to a special foot restraint allowing him/her to work freely outside the space station. Today's picture from an August 2005 Space Shuttle Discovery / ISS docking mission shows astronaut Stephen Robinson in action some 240 miles above the earth! If all goes according to plan, a second robotic arm will be fitted to the Russian section of the International Space Station in November 2007.